I had a tough time finding a character to spotlight this month. Nobody really stood out, plus I've been in a bit of a reading slump lately. So I decided to go with Bubba Burdette, from Sherrilyn Kenyon's Chronicles of Nick series. 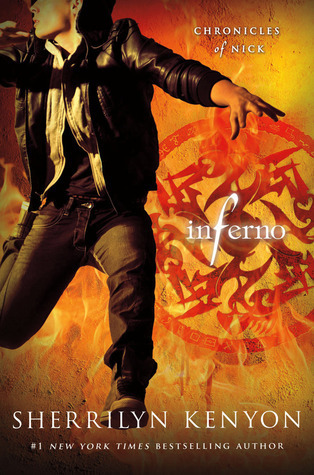 I read the most recent book, Inferno, earlier this month, and though Bubba, who's one of the minor characters, doesn't appear as much in this one as he has in previous books, he's a big reason why I enjoy reading CoN. Bubba is a friend of the title character, Nick Gautier, and is also the proprietor of the Triple B, a gun and computer store. That may sound like an odd combination, but as the Triple B's slogan goes, if Bubba can't fix your computer problems one way, he'll fix them another. In his spare time, Bubba, along with his sidekick, Mark, helps keep the world safe from supernatural beings who are looking to cause trouble for humans. Bubba also has his very own panic room built into the Triple B in the event of a zombie apocalypse. Believe me, if there's a zombie apocalypse, you want Bubba and Mark on your side. Their adventures often land them on the wrong side of the law, such as when they go a little flamethrower-happy in Inferno, but they're all for a good cause. Bubba may sound a bit quirky, but I find him incredibly cool. He's also brilliant—he graduated at the top of his class from MIT. I think what I love most about him, though, is how he looks out for Nick, whose father is not in his life. Bubba is one of the few characters who can silence Nick, who is a nonstop sarcasm machine, and I always look forward to Nick's visits to the Triple B.
Bubba sounds fantastic. What's not to like LOL? Flame-thrower happy, handy in a zombie Apocalypse and can silence sarcasm-happy bystanders. I like! Jaclyn @ JC's Book Haven. Bubba takes the zombie apocalypse very seriously, that's for sure! His zombie-hunting efforts, which can be unorthodox at times, are so much fun to read about. Mine is early this month because we're participating in Armchair BEA this week. I can't wait to check out your pick for this month! Bubba sounds awesome and I love quirky characters as well! I love how he's a genius, yet kind of scary. I think he should get a spin-off!